1 Watt audio amplifier for mobile device has been designed using LM4890 power amplifier. 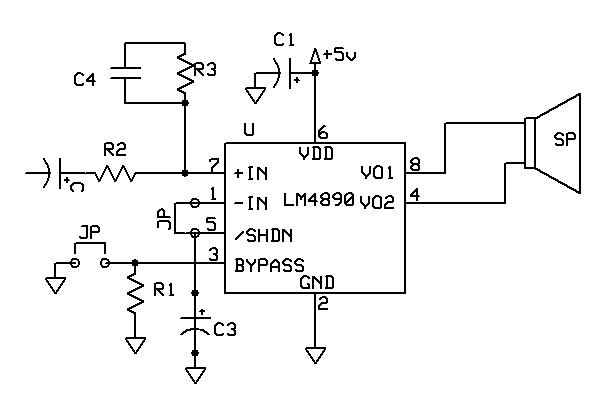 LM4890 is primarily designed for mobile phones and other portable devices. It is capable of delivering 1 watt of continuous average power to an 8 ohm load from 5v power supply. It has a distortion of less than 1%. LM4890 does not require output coupling capacitors and therefore ideally suited for mobile phones and other low voltage applications where minimal power consumption is primary requirement. Power output at 5v is 1 watt and at 3.3 v it is approximately 0.4 watt.